Side by Side was installed in 2017 at the Chilliwack branch of Vancity. This commissioned piece is suspended in front of a light wall. It represents different aspects of the Chilliwack community: agriculture, education, the arts, Sto-lo first nation, the military, sports and the outdoors. Contemporary and historical photos were photocopied on acetate and sewn on the polyester fabric. McLeod park in the township of Langley, 2016. Two of my designed were translated in aluminum plates for a barrier that separates the field of play from the spectators. “Wheels of Change” is a temporary community-based public art project for downtown Chilliwack on the theme of mental health. It was approved by the city of Chilliwack in April at the recommendation of the public art advisory committee. “Wheels of Change” is supported in spirit by the Ruth and Naomi’s Mission. This installation is an opportunity for the community to reflect on mental health and think about ways to put the wheels in motion to achieve better mental health. It is ready in time for Mental Health Week, May 4 to 9, 2015. Made and installed in Spring of 2015.
site: fence of the community gardens, downtown Chilliwack, B.C. Community based project about mental health awareness. 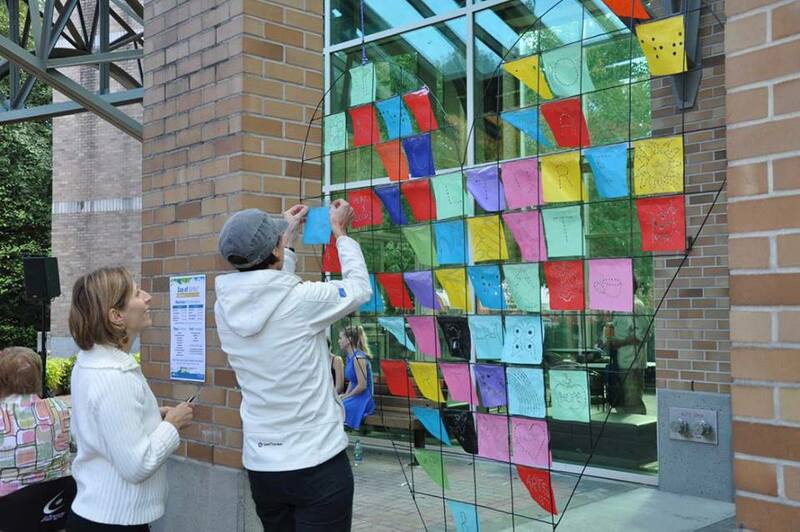 One day public art project (September 26, 21015) in Port Moody at city hall for "Culture Days"
Fabric burning with the public. Description: The sculptural installation consists of 8 large colourful flowers spelling W-H-E-E-L-S-of-Change attached to the fence. Each flower has a large heart made from a bicycle wheel rim with synthetic fabric stretched inside it. There are images and words inspired by the theme of mental health filling the large circles, stem and leaves. This is done in workshops, led by the artists, where participants will reflect on the issue and experiment with “fabric burning”. Invented by Sylvie, this technique consists in melting holes in synthetic fabric with a soldering iron. Process and logistic: Sylvie Roussel-Janssens managed the technical aspect of the workshops, assembling the components and setting-up the finished installation. Rob Dueck took care of communication with the participants, engaging them in storytelling resulting in a visual finished product. All tools and material were provided. Timeline: “Wheels of Change” will be at the Yale road site for the whole month of May with a possibility of extension in consultation with community partners. Budget: “Wheels of Change” is a self-financed project for the artist. Special thanks to: William C. Wiseman and Pedalsport for donations of used bicycle rims and Bill Raddatz at the Ruth and Naomi’s Mission for his support. In October 2015 in Port Moody, I had a one day public art project for ''Culture Days''. A hart shaped grid was suspended between pillars of the front entrance of city hall. Members of the community came and did some fabric burning on a square of fabric. People of all ages and cultural background expressed the meaning of culture on the fabric.